You guys were great and I really appreciate everything you did to make the move go as smooth as possible. I will recommend you to anyone (and everyone) I know, and will absolutely keep you in mind for my next move, wherever that may be. 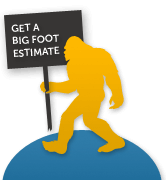 Big Foot Moving & Storage has been expertly handling local & long distance moves for individuals and businesses for years. No matter what situation you find yourself in, Big Foot Moving can help. Here are a few of the common moving questions we’re asked. If you have any other questions about your upcoming move, please contact us online or by calling Big Foot Moving & Storage, Inc. at 781-488-3090. If you are looking for a moving company that’s reliable, honest, and get’s the job done perfectly, Big Foot Moving is your answer. Over the years, I have dealt with several moving companies in the Boston area, but never been so satisfied until I went through Big Foot, twice that is! Big Foot moved my belongings from one residence to storage at their Charlestown facility. When I decided to pull my stuff out of storage and embark on another move (this time out of state), they accomodated my request during one of the busiest times of the year, the holiday season. Dealing with President, MikeBavuso, and his team of movers was a great experience. I would highly recommend Big Foot Moving & Storage, especially if you are looking to make your move as smooth as possible, with a team of people you can trust.